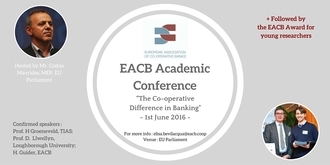 The EACB Academic Conference "The Co-operative Difference in Banking"
The European Association of Co-operative Banks announces its Academic Conference “The Co-operative Difference in Banking” that will take place on 1st June 2016 (16:00-18:00) at the European Parliament in Brussels, hosted by Mr. Costas Mavrides, Member of the European Parliament. Confirmed speakers include: Mr. Costas Mavrides, MEP, European Parliament; Prof. H. Groeneveld, TIAS University; Prof. D. Llewellyn, Loughborough University; Mr. F. Lang, Research & Market Analysis, European Investment Fund. Following the conference we will celebrate the winners of the EACB Award for Young Researchers. The detailed program will follow soon. The event is by invitation only. If you are a co-operative banker, a researcher, an academic, a EU officials or you are simply interested and want to learn more please contact: Elisa BEVILACQUA.